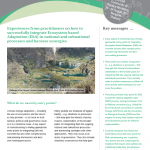 How to mainstream Ecosystem-based Adaptation (EbA) in national and subnational processes? How to generate evidence on effectiveness and what are success stories on communicating EbA to a wider audience? What are opportunities and instruments for financing EbA measures at different scales? And how to set up monitoring and evaluation (M&E) systems and indicators to track adaption results? Monitoring and evaluation on EbA success. Four learning briefs summarizing the outcomes of the workshop sessions are now available here. The EbA Community of Practice, supported by the Global Project ‘Mainstreaming EbA’, which is funded through the International Climate Initiative of the German Ministry for the Environment, Nature Conservation, Building and Nuclear Safety and implemented by GIZ, is a knowledge and exchange network of EbA practitioners primarily from governments and international organisations as well as civil society and research institutions with an interest in strengthening ecosystem-based adaptation in planning and decision-making.